Granny tests out the app. Knowing a little first aid can make a very big difference. For you, for your family, for the people around you. In fact, knowing how to help someone if they are hurt or injured is one of the most important skills you can learn. We've had some occasional first aid training in the past, with the main thing I remember being that knowing a little is important - you don't have to be an expert to save a life, but need to know what to do straight away. Because 'first' aid is just that, a first initial action that can make all the difference. 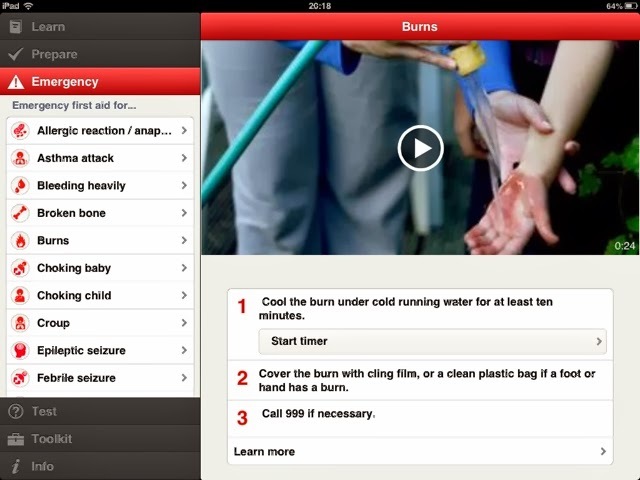 And that is where this brilliant free app from the British Red Cross comes in. It has three main sections to help you learn (step-by-step guides to deal with a range of first aid situations such as burns, choking or broken bones), prepare (checklists and tips to minimise risks to you and your family) and then deal with an emergency. This third emergency section includes the step-by-step guide, as well as useful tools built in to the app. For example, with a burn it advises to put it under cold running water for 10 minutes, and has a built-in timer. The app includes training videos, too. The guidance steps are clear, easy and simple to follow. With each section, there is a test to help you remember what you've just read, and pointers if you get a question wrong. As well as more information about the British Red Cross, there is a toolkit to help you find the nearest hospital or create and share child medical records so all the important info gets stored safely. So, how well does the app work? Well, we think it is a great way to learn the basics of first aid or to have to hand in an emergency. I would definitely recommend downloading the app, and would suggest going through the tutorials as it is better to have some knowledge before an emergency happens to give you some confidence in advance. The app is not a replacement for attending a first aid course, and I think everyone should have some first aid training. The app has a tool so you can book a course relevant to you, too. We shared it with Granny who often looks after our kids (thank you Granny!) and it turned out she already knew about it. She told us she thought it was a 'brilliant resource' and she has told everyone about it. The app is available free of charge on iTunes App Store for iPhone and iPad or Google Play for Android devices. Another area that we feel is important is not only knowing what to do to administer first aid to a baby or child, but also to teach a child the basics of first aid. There is no reason why a child cannot learn how to put someone in the recovery position, or call for help in an emergency for example. The British Red Cross have a truly excellent area on their website called "Life. Live it. First aid education for Children" where kids can learn about keeping safe in the first place and how to do first aid and get help if they need to. We spent some time looking at this website last year as part of one of our homeschool topics. It was a really good prompt for us to remember to keep safe and the children really enjoyed looking at it. It is really interactive too with games, videos and quizzes. We would highly recommend having a look at that too!